See Registration page for current pricing. 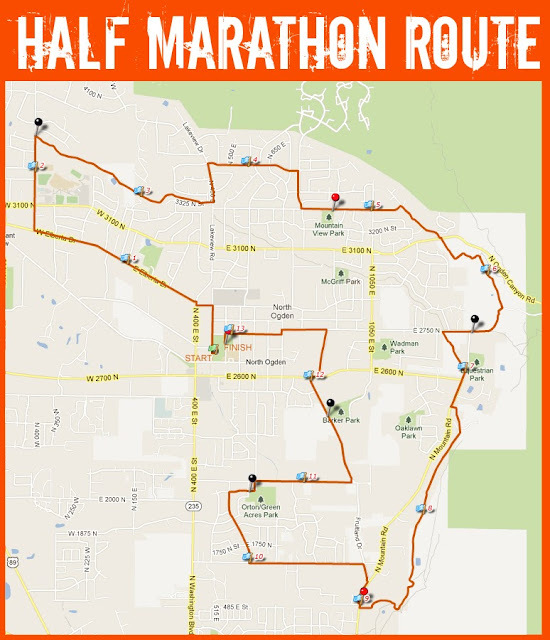 The half marathon starts at Bicentennial Park on 400 East and heads West on Pleasant View Drive before turning up near Weber High School. Heading back East, runners will pick up on the canal trail as part of the 5.3 miles of trail system and head toward the beautiful mountains. 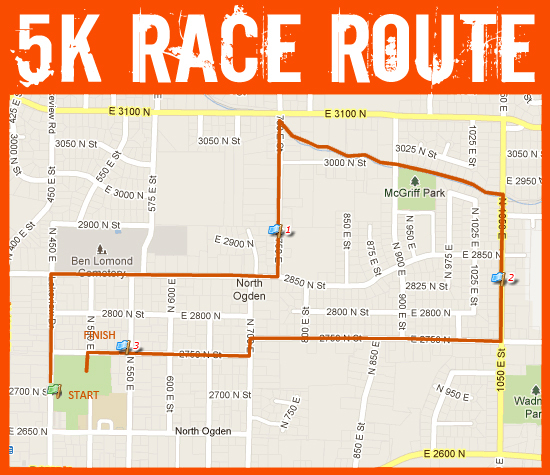 Runners will connect with the scenic mountain trails before winding back through the North Ogden Business District and finishing at Barker Park. Elevation for the N.O. 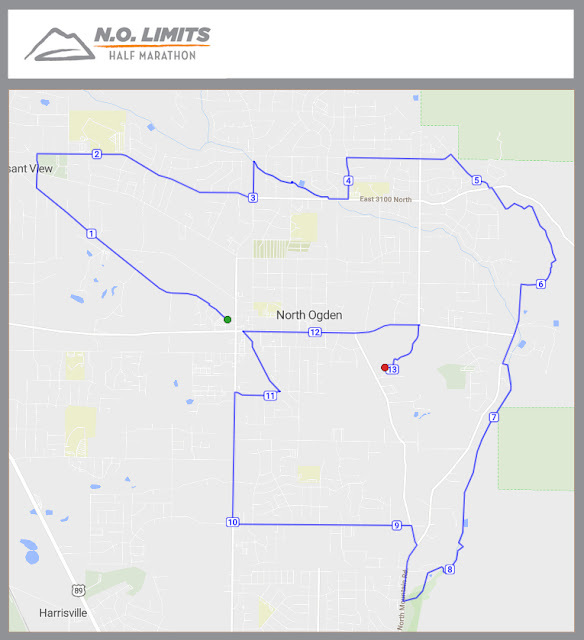 Limits Half Marathon begins at 4,389 feet above sea level. Runners will experience a 1,140 foot total elevation change and finish the race at 4,507 feet above sea level. Pick up your race bag at the North Ogden Parks and Recreation Office (2705 North 550 East) either Thursday, May 9th or Friday, May 10th between 8:00am and 5:00pm. 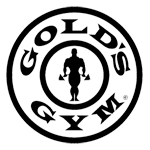 Same Day Registration is from 6:00am - 6:30am at the Parks and Recreation Office at North Ogden Park. Same Day Registration Cost: $55 (Half Marathon) and $35 (5K). We accept cash, check and credit cards for same-day registration. The first 250 runners registered will receive a FREE PERFORMANCE T-SHIRT and DRAW STRING RACE BAG. Parking is available at Bicentennial Park. Runners will need to arrange transportation from the finish (Barker Park) back to their vehicle. 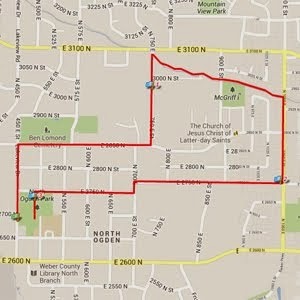 Distance from finish to start is 1.1 miles. If you have any items that you need to drop during the race, please drop them at the aid stations. All gear collected at the aid stations will be brought to the finish line at North Ogden Park. Gear dropped anywhere else along the race route will not be collected. All gear not retrieved from the finish line or Parks and Recreation office by Friday, May 17th, 2019 will be thrown away. North Ogden City is not responsible for lost or stolen gear/bags. The starting line for the half marathon will be at Bicentennial Park. Portable restrooms are available at the park, and last minute instructions will be provided at the starting areas. As a courtesy to other runners, please line up according to estimated race time, allowing the fastest runners to the front. The Half Marathon will start at 7:00am. The races will be chip-timed. Your time will begin when your cross the starting line, not at the start gun, and will stop when you cross the finish line. Timing will be coordinated by Wright on time racing. You chip will be attached to your race bib and does not need to be returned at the end of the race. We have done our best to mark any hazards along the race trail. A good portion of the race is on unpaved trail and may have uneven ground. Race volunteers will be present at all major intersections and turns on the course to help guide runners and stop traffic when necessary. We have posted caution signs at road crossings and ask that you be aware of road traffic around you. Please watch for cars when crossing the streets, and follow the direction of all safety officials and volunteers in order to ensure your safety. There will be a race crew member following the last runner of the half marathon who will be able to provide emergency assistance and call for help if needed. The half marathon course will remain open until 10:30 AM. Any runners still on the course after that time will be considered pedestrians throughout the course duration. To make it to the finish by this time, half marathon runners will need to average a 16:00 minute/mile pace. This is equivalent to a very light jog, or brisk power walk. Any participants still on the course after these cut off times may continue to proceed along the course route to the finish area, but aid station and traffic control will not be available. This race does not have pacers. You can run at your own pace and enjoy the spectacular views. There will be seven aid and/or medical stations along the race route (marked in black on the race map). All of our aid stations will be supplied with electrolyte fluids and water. Medical stations are noted in red on the race map and will be equipped with basic first aid supplies. If you are in need of these items, please stop and ask the volunteers at the station and they will be able to help you. Restrooms will be available at each of the parks (Barker Park in Pleasant View – Mile 1.8, Mountain View Mile 4.3, Equestrian Park Mile 6.3, Exit from Trail at Mile 8.5, 2300 North Mile 1, Barker Park Mile 13). Mountain View (Mile 4.3) has the restroom closest to the race route. The restrooms are in the buildings located at each park or a portable restroom. There will be photographers at a few locations along the course to take pictures of your race experience. Be sure to smile, make a face, or strike a pose for the cameras as you go by. Also make sure that your bib number is visible. Photographers will also be at the finish line to take your photo in front of our finisher backdrop. Come prepared for any type of weather. We can't control it, but we can provide some historical data for you over the past few years. Race times will be available shortly after you cross the line at Barker Park. They will also be posted online as soon as possible after the race. All runners completing the half marathon will receive one of our incredible finisher's medals as they cross the finish line. Additionally, the top three finishers in each age division will receive a division ribbon. The top male and female finishers for the half marathon will receive $100 each. The awards ceremonies will take place at 10:00 AM for both races.